Spearheaded by Scott Klass - and rounded out by "a rotating posse of pals"  The Davenports have been going strong for nearly 20 years . It's not difficult to hear why, either, as Klass' gentle compositions and earnest songwriting evoke the inviting, bittersweet charm of artists like Weezer, Andrew McMahon, Ben Folds, Danielson, Loud Family, and Half-Handed Cloud. Their past records have "set tales of love, lust... money-dangling mothers, superstitious panic attacks and the like to a torrent of melodic rock", and their latest outing, Don't Be Mad at Me, perfectly follows in that tradition. Filled with smooth, slightly punky angst and raw yet beautifully affective arrangements, it's a must-hear collection for any fan of the style. The record features Shirley Simms (of the Magnetic Fields) on Miranda in Her Room (marking the debut a Davenports song with someone other than Klass on lead vocals). In addition, I Don't Know What to Do sees him co-writing for the first time (with the Merrymakers' David Myhr) and employing his daughter's voice on the chorus. While those two tracks are definite highlights (the former for its Americana elegance and the latter for its Pixes-esque catchy fervor), several other selections standout as well. Opener Where Shall We Hang Elena? allures as a lone piano ballad inspired by an incredible 1960s/1970s era photo Klass had of his mother, who died when he was only 12, yet the song is not about his mother, but a fictional girl, who both mesmerized the family and caused them heartache. Likewise, the title track - and Klass' favorite of the bunch was written about his aunt (who had dementia and was cared for by his father) and transforms cleverly from a somber progression to a full-bodied slice of pop glory. In doing so, it captures well the melancholy of the situation. Expectedly, To the End finishes the sequence with a subtle sense of direct closure and hope, complete with steadfast acoustic guitar strums and jazzy keyboard intervals. 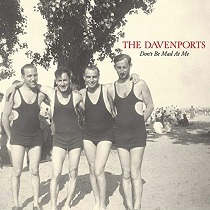 Really, every song on Don't Be Mad at Me reveals just how strong the Davenports are still going after all these years.   PopMatters.com This is another feather in the band's cap, offering up 10 melodically-charged, literate pop songs for your listening, dancing and romancing pleasure. The lovely title song, one of my favorites from Klass's esteemed catalog, and one of the finest melodic pop songs in recent memory, barely scratches the surface of the joys that this album brings. I Don't Know What to Do, a miraculous Klass and David Myhr co-write, and the fine ballad called Where Shall We Hang Elena?, are two more gems that will no doubt burrow in your brain upon first listen.  Alan Haber/PurePopRadio.com They even cover George Michaels' "Freedom"! GREAT! !